So...here I am. I've just had lunch in Old Amersham and have arrived at Lowndes Park in the centre of Chesham. The only reason I have come here is because I have quite vivid memories of learning to ride my first bicycle here. The feeling of propelling yourself in a straight line without the aid of stabilisers for the first time is something you don't forget that easily! I can remember arriving here at Water Meadow car park in one of my parents first cars which was an Austin A40 along with my bike and a bag full of bread to feed the ducks. Up until then we had been used to travelling in a sidecar attached to my dad's Norton 500*. An Austin A40...ours was a bit bigger than this obviously. *I am corrected by my mother who tells me that although my dad did indeed have a Norton 500, the bike he had when I was born was a BSA 500 and this was the bike which had a sidecar attached to it. 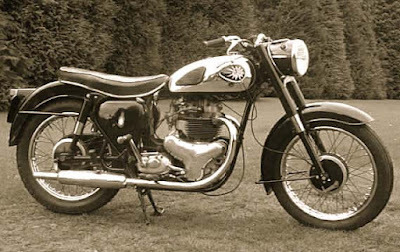 So, for the record, here's a BSA A7 500cc bike...hopefully not too far off the one we had in 1961! 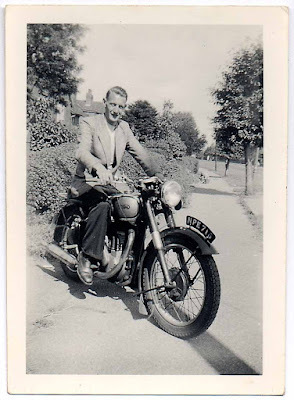 This is my dad on his Norton 500, year unknown but I guess at some point in the early 50's. What a great looking bike! 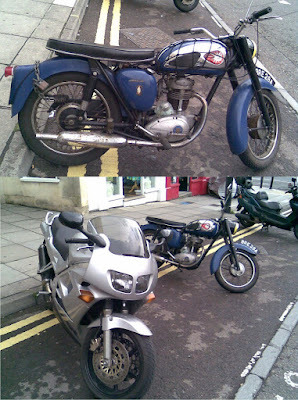 Strangely enough, I found myself parked next to a BSA C15 250cc just the other day here in Bath. The C15 was the first ever motorcycle I had which I bought in about 1979. It was blue like the one below but I decided to paint it black. I loved that bike but it did break down a lot. My current bike, the Honda VFR 750 parked next to the BSA C15 in Bath. Bizarre - my parents also had a Norton 500 single (ES2) to which was added a sidecar when my brother was born. 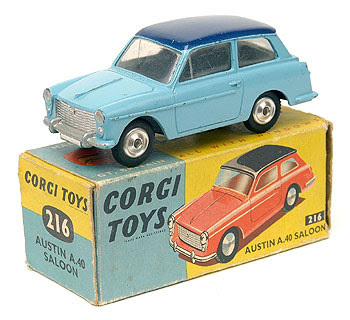 When I arrived Dad got a grey Austin A30 van (see Wallace & Gromits) eventually upgrading to a blue Austin A30 with a white (not racing) stripe down the side.